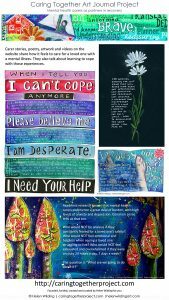 I have presented at a number of conferences both within Australia and overseas, using my artwork to share the carer experience and promote partnerships in recovery. 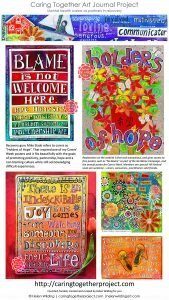 The Caring Together Art Journal Project (caringtogetherproject.com) is a cost recovery social enterprise founded in 2009. 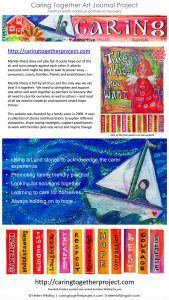 It uses a collection of stories and illustrations to explain different viewpoints, share coping strategies, support practitioners to work with families and inspire change. The Project aims to answer these questions: How does it feel to care for a loved one with a mental illness? How can we support others while also caring for ourselves? Where can we learn about mental illness? What does recovery mean? How can carers, consumers and practitioners work together as a team? How can we keep hope alive? 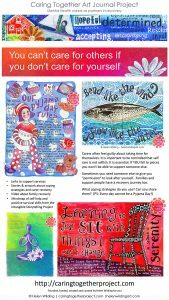 This poster will share some of the artwork from the Project with the aim of celebrating carer strengths and experiences in a positive and uplifting way. It will also highlight free resources from the Project which promote positive attitudes towards service users and their supporters. The poster comprises 8 slides designed for an upright interactive kiosk. Helen has made each slide into a free downloadable poster for members only. Click here to login and download the posters. Helen represented the carer viewpoint in the trialogue with mental health consumers and practitioners. Helen was one of four presenters speaking about family and carer recovery. Helen Wilding with Andrew Shakespeare (Mind Australia). 30 minute presentation on family and carer inclusion in care – how it can work and why it really matters. Voices Vic approached Helen to speak at this conference – and it was a real honour to present at such an inclusive and welcoming consumer run event. 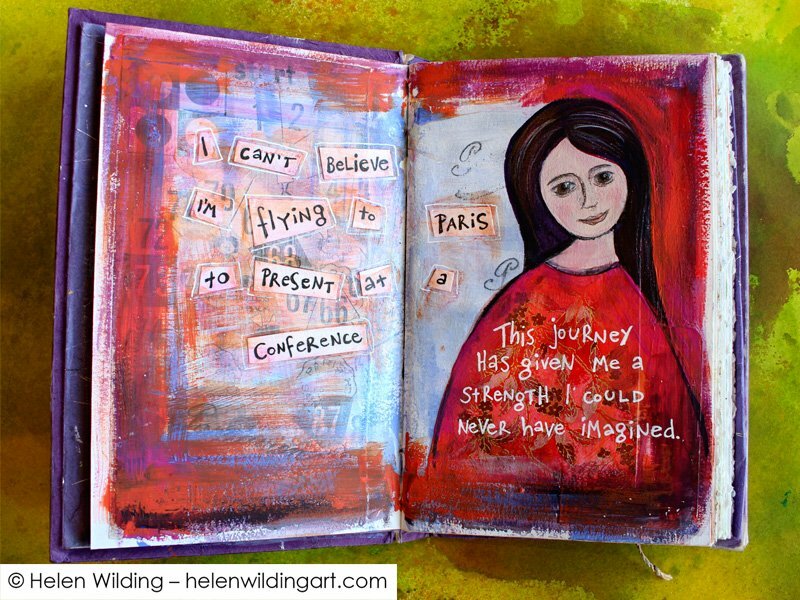 Helen gave a 30 minute presentation about the Caring Together Art Journal Project, and some of her prints were also on display. 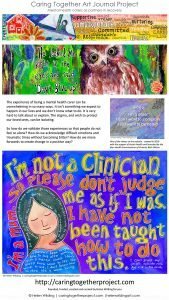 From the abstract: “Two innovative training resources for clinicians working with families and carers come together to share the lived experience of caring through storytelling, artwork and multimedia. 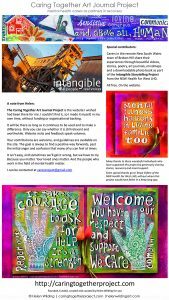 Intangible from the Far West of NSW, and the Caring Together Art Journal Project (http://caringtogetherproject.com), from Victoria, collaborate to show that the caring experience is universal, whether you are a parent with a child at an inner city CAMHS, or caring for a much loved adult in remote Australia. Fifteen pieces of Helen’s original artwork were on display alongside the Cunningham Dax exhibition for the four days. 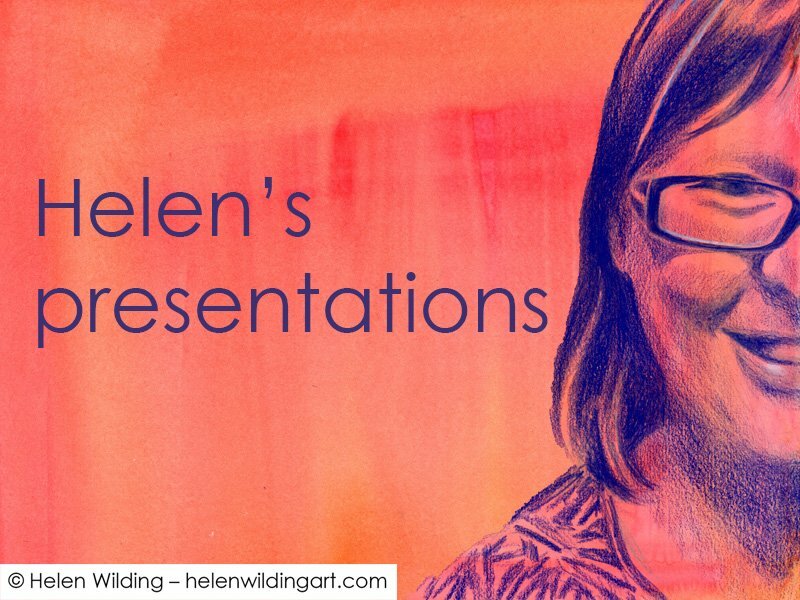 The Victorian Carers Network approached Helen to speak at the TheMHS Carer/Family Forum, and from that point she became involved in a number of other presentations over the four days, including an exhibition of her original artwork. Tuesday 20 August 2013 –– 10.45 am – What defines wellbeing? Abstract: Caring for someone with a mental illness can be an exhausting, confusing and overwhelming experience – but one that truly is a labour of love. It is a difficult thing to talk about – even to friends and family. It can make you feel out of your depth and terribly lost and alone. 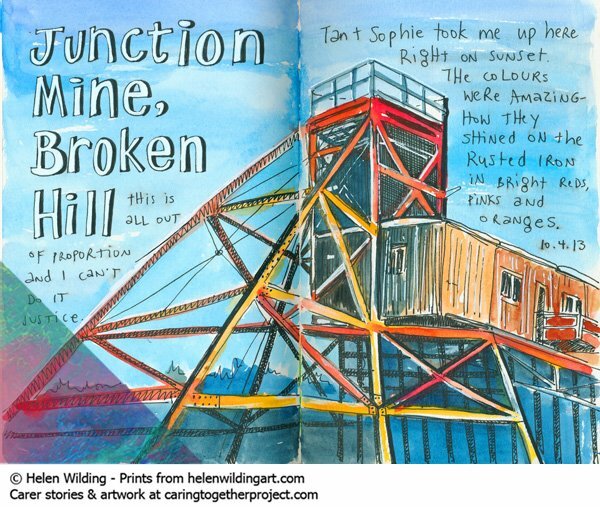 As a carer, Helen coped by unloading her emotions into her drawings and stories. It made her feel better, and she thought that acknowledging those experiences out loud might help others too. 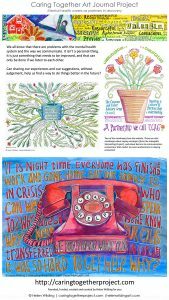 And so the Caring Together Art Journal Project was born – a website full of illustrated stories about both the tough times and the good times – a place to share ideas, inspiration and hope, and discover ways to cope. Through a shared understanding of the carer experience it has also become the perfect place to start a conversation with mental health services – a conversation of mutual respect and partnership. Helen and Lynne look forward to introducing you to the project, showing you all sorts of ways to use it, and hopefully inspire you to contribute something yourself. Thanks to Tanya, Sophie and the rest of the team for making Helen feel so incredibly welcome during her visit. The entire trip was a real pleasure – from the personal tour of the mental health service, treats at CAMHS, feeding the joeys and baby pig (!! ), meeting such an inspiring group of carers, and sunset at Junction Mine. Using Helen’s slideshow “I don’t want to complain”, mindmaps and other artwork, the presenters aimed to shed light on the many reasons why communication between clinicians and families/carers might be difficult – and brainstormed how to overcome those barriers to work together successfully. Helen Wilding (Caring Together Art Journal Project) and Lynne Ruggiero (Austin Health) were invited to present to a large group of mental health social workers. The Conference was arranged by the South Eastern Cluster of Social Workers in Mental Health on the topic of “Family Business or Risky Business? Social Work and Family Inclusive Practice”. The presentation began with the slideshow, “I don’t want to complain”, and introduced the Caring Together Art Journal Project and its beginnings. 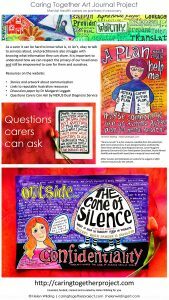 It shared insights into the lived experience of carers and discussed communication issues, based on the Conversation Starter “I don’t know what to ask”. Helen and Lynne were made very welcome by a group of obviously open minded clinicians keen to hear the family point of view. The full paper (with illustrations) was published in the TheMHS 2011 Book of Proceedings. I can be engaged for workshops and presentations on a cost recovery basis. Please contact me for more information. This project does not receive funding, and I am only able to present on a cost recovery basis. This includes recovering costs of travel from Melbourne, accommodation, conference fees, materials, lost income from my usual occupation, and reasonable time for preparing, presenting and travelling. These costs are charged at the rate of a senior allied health professional, in keeping with my usual employment.